Three chums meet up in a motel room after their 25th high school reunion. It's the same room they had 25 years ago, after graduation. There's ritual, there's anticipation, and there's the chance to compare how much each has moved on. Two have left town. One stayed put. One has twin sons and two-week-old daughter. One is divorced, with a son. And one, unmarried, still lives in his parents' house. Is this an occasion to catch up, reminisce, and relive glory days? Not even remotely. Gregory S. Moss' Reunion, directed by Adrienne Campbell-Holt for South Coast Repertory, is a corker of a story that examines, at times in excruciating detail, the complex relationships of boys who became men who, for one night, became boys again. 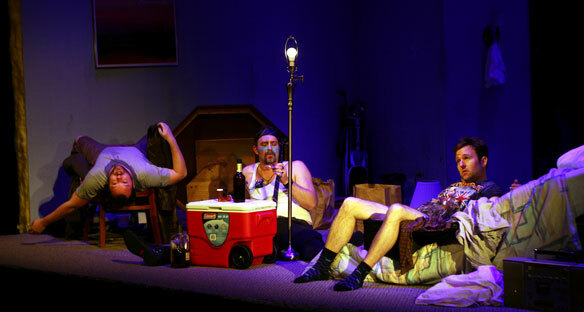 Set in a Boston suburb motel room, the production brims with id and angst, with traces of testosterone thrown in for good measure. To describe it, it's funny. The three friends party like it's 1989. They trash a motel room like rock royalty. And they talk smack about each other and about high school girls. Their zingers become more lethal. To describe it, though, it's powerful and, at times, scary. Campbell-Holt turns Moss' story into a true confessions catharsis that won't provide much relief for Peter (Kevin Berntson), Max (Michael Gladis), and Mitch (Tim Cummings), but will certainly give us a lot to think about. The story begins purposefully awkward. It takes awhile for the three to open up. It's been a quarter century, after all. Of course, alcohol, pot, and boom box rock-and-roll provide the social lubricants, just as it did in high school. Then it becomes surreal. Once things get rolling (rocking too, for that matter), the revelations are startling, to put it mildly. So is the acting. The three actors managed to convincingly switch back and forth at will between teenagers and middle-aged adults, with all the psychoses and hang ups of both age groups. At first Berntson's Peter is gung ho and eager, poised if not gawky. He's the only one of the three who tried to stay in contact. By the end you understand why. You feel he set up the reunion to show his two friends how much he's matured since high school. Of course, when all three revert to form, he becomes the toy nerd for the other two (stuffed in a mattress; taped to a door). Even that doesn't get him to leave. No, that's because of some intelligence he gleans, intelligence that shows that things haven't changed much since high school. Gladis' Max and Cummings' Mitch sit on a keg of dynamite. It's not because of what Max had done to his infant son or because Mitch never moved on emotionally after high school. When you learn their secret, you understand how things not addressed at the time or even later, in therapy, continue to simmer and impact subsequent events. Untreated, as happens here, they boil over. Performances are 7:45 p.m., Tuesday through Saturday, 2 p.m., Saturday and Sunday. The show runs until March 30. Tickets are $22-$62. The Theatre is located at 655 Town Center Drive, Costa Mesa, CA 92626. For more information call (714) 708-5555 or visit www.scr.org.